The embodiment of the words of trump was the introduction of the US tariff of 25% on imported Chinese goods worth $50 billion. This was implemented in two stages — July 6 and August 23 in the amount of $34 billion and $16 billion, respectively. China has imposed similar restrictions in two stages and the same amount. Accusations of Chinese espionage — is not news, the White house has repeatedly accused China of stealing technology. Relevant statements sounded from lips of the Vice-President of the United States, Mike Pence, and US trade representative Robert Lighthizer. The same, according to CNBC, will make again soon and President of the trump. Only it is not just about stealing technology, how many secrets of the state as a whole. One of the most visible areas in which anti-Chinese campaign of Washington were the claim to the it industry of China, is actively developing in the United States. In particular, this affected the companies ZTE and Huawei, smartphones and other products which the United States authorities regarded as a potential threat to the security of the country. In the spring of 2018 ZTE deprived of the right to supply products in the United States. The dispute between Washington and the Chinese were settled in June, when the company was ordered to pay $1 billion (and change the composition of the Board of Directors), but later this agreement was blocked by the Senate. In addition, in the trade war the important role of the U.S. military. The Pentagon, as reported in may, the WSJ, have banned sales of smartphones ZTE and Huawei on U.S. military bases, and further attacks on Chinese companies continued. So, in August it became known that the new US defence budget in fiscal year 2019 involves the introduction of a ban on the purchase and use by government agencies of equipment ZTE and Huawei. A trade war between the US and China, despite trump statements about its necessity, could not fail to be one of the most significant problems of the current head of the White house. Trade conflict caused both the economic effects of uncertainty about the future cooperation between the two countries and strengthening political differences between the United States and the growing power of China — in particular, activity in the Asia-Pacific region. It is not surprising that trade war was the main topic of the meeting between U.S. President Donald trump and the head of China XI Jinping at the G20 summit in Argentina. At this meeting, trump and XI Jinping have agreed to make efforts to conclude new trade agreements between the countries for 90 days. According to the press service of the White house, after this period, the President of the United States intends to raise duties on Chinese goods from 10% to 25% in that case, “if the end of the allotted time, the parties will sign the agreement”. It would seem that after a personal meeting of leaders a question about a trade war can be considered, if not solved, then at least under control. But it happened on the 1st of December, and on the same day, by happy coincidence, in Canada, was detained Huawei CFO Meng Wanzhou. Meng Wanzhou is not just a senior Manager, but also the daughter of the company founder, who has ties with the Chinese army. As noted by the Prime Minister of Canada Justin Trudeau in the arrest of a top Manager was not politically motivated. 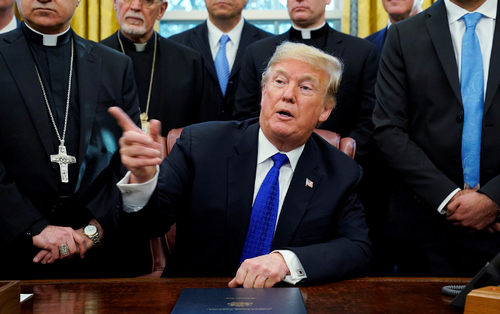 The US President was more categorical and directly linked to the Wanzhou business with a future trade deal, noting that it can be released under, as Reuters reports, “more trade agreements.” Trump in fact even then hinted at the fact that the case of the CFO can act as a bargaining chip in negotiations, directly contradicting the words of Trudeau. The White house has accused of misconduct in the US and use things to their advantage, but it does not change the essence of his approach to such issues. Despite the fact that Canada openly urged him not to politicize the matter. Although the negotiations took XI’s almost lost to Trump, it is unlikely that the United States will be wise to twist the arms trading partner. The arrest of former diplomat Canada — a trifle compared to what one can reply directly to Beijing to Washington. China — the country in which you are most produced in the world of technology. The transfer of production will require a long period of time. In addition, to establish processes and achieve a cost close to that obtained in China, is a very nontrivial task, despite the growth of average salaries in the country. China itself is a huge market for leading companies. Therefore, Japan, Australia, other countries and companies who supported the blocking of the products ZTE and Huawei should be prepared for retaliation. Chinese branches of government is difficult to suspect in independence, but they are able not only to engage in an open confrontation. On 10 December, a court decision suspended the sale to China of the seven models of iPhone at the suit of Qualcomm. Formally investigated two American companies, but it is no coincidence that the decision taken at the time of the incident, Meng Wanzhou. Companies are patent wars constantly. If you wish, and have “support” such claims may be many, not only from American but also from Chinese companies. So in July of 2018, the company JHICC were able to achieve temporary ban sale us memory company Micron in China. According to an investigation by the us authorities, JHICC for several years was engaged in deliberate theft of American technology. In the current conflict, the United States and China is not only the economy but also technology. Who will be their supplier, can the United States to move the Assembly into its territory? Even the formal end of the war duties is not talking about ending the conflict. It was shown above that it can easily flow into the patent war. It is also clear that the unfolding struggle for markets. British operator BT has banned Huawei to create a 5G network in the country. To address the issue of the Chinese company had to change some of the details of networks and even to change a few heads. A similar ban on the construction of 5G network came out in Australia and in Japan, Huawei and ZTE will not be able to compete for government contracts. It is unlikely that China will abandon the protection of the rights of “their” companies. Particularly alarming due to the fact that the leadership in Beijing and Washington alike can expect any development scenario, from the next agreement before the transfer of a trade war to a new level. While she will walk, will decrease the availability of new technologies will be difficult to use established production facilities in China (the production of which at any moment can be declared containing the spy function). The only positive consequence of these wars — perhaps they will open the way to the market for new companies that are not in the crossfire of competitors and regulatory authorities.